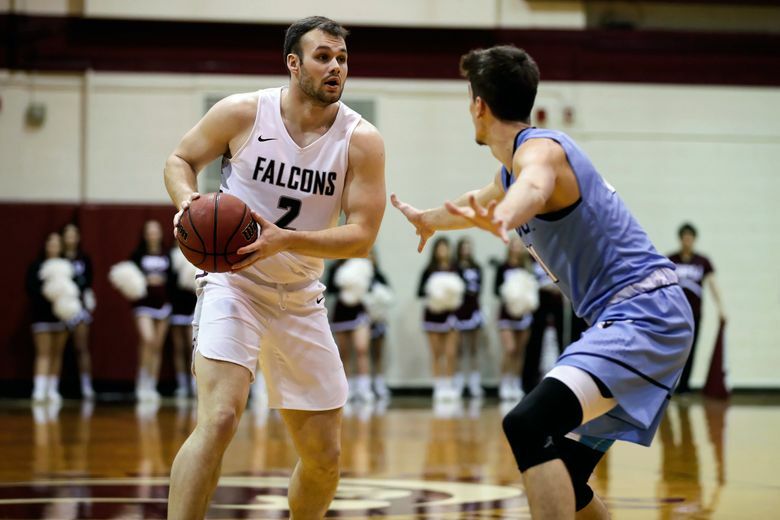 The Falcons are a game behind Saint Martin’s with two games left before the conference tournament and in a good position to get an at-large berth for the NCAA Division II tournament even if they don’t earn the conference’s automatic berth. What a difference a month has made for senior forward Coleman Wooten and the Seattle Pacific men’s basketball team. On Jan. 26, the Falcons were pummeled at Montana State-Billings 92-63. It was their third straight loss, their record fell to 9-6 and their season was on the brink of coming undone. And boy, did the seniors respond. “Guys started playing with a different desperation,” Wooten said. Led by Wooten, SPU has been perfect since, winning eight straight heading into Thursday’s game at Central Washington. Last week, the Falcons defeated No. 12 ranked Saint Martin’s 67-63, then on Senior Night at SPU, they avenged the loss to Montana State-Billings with a 76-67 victory. The Falcons (17-6) are tied for second place in the Great Northwest Athletic Conference with a 14-4 record. They are a game behind Saint Martin’s with two games left before the conference tournament and in a good position to get an at-large berth for the NCAA Division II tournament even if they don’t earn the conference’s automatic berth. That might have been hard to believe before the recent run. Wooten has led the way, leading the team in scoring in four of the past eight games after not leading the team in scoring in any of the first 15. He is shooting a remarkable 66.7 percent from the field in the winning streak (50 of 75) and 64 percent from three-point range. “His efficiency has been through the roof,” said SPU coach Grant Leep. Wooten figured it was a matter of time. Wooten, third on the team in scoring at 12.2 points, is one of seven active players averaging between 7.9 and 13.0 points per game. He leads the team in rebounding, averaging 7.8 as an undersized 6-foot-5, 235-pound power forward. He became very good and was the South Puget Sound League player of the year as a senior for Tahoma High School in Covington in 2014. He had interest from a few Division I schools, including Army, but has been more than happy playing Division II ball with the Falcons. “My dad gave me advice to go to the place that is going to be the best fit long term,” Wooten said. “Because after you make the decision, there are going to be people who like it and people who don’t, but after that two weeks, you are stuck with it and no one else really cares. Nothing in the next five years (he redshirted as a freshman) has changed his mind. A three-time GNAC All-Academic honoree, Wooten has a degree in accounting and expects to add degrees in finance and information systems before the end of spring. “I’ve loved it here and it’s really confirmed the decision I have made,” said Wooten, who lives with senior teammates and fellow captains Sam Simpson and Nathan Streufert, both pre-med students. Wooten spent last summer as an auditing intern at Ernst & Young and has a job offer to begin working full time there in October if he elects not to pursue professional basketball. But for now, he is fully focused on his final season with the Falcons. After making it to the NCAA Division II tournament 12 straight years (the longest streak in the country), they have missed out the past two seasons. All of which makes this monthlong run that will seemingly get them back into the tournament so special. “Being part of the team that ended the streak was tough, but I think at the end of the day we knew it was going to turn out like this,” he said. Wooten said the team is capable of playing with anyone. Leep, in his third year as head coach, is happy his players are being rewarded for their improved focus.